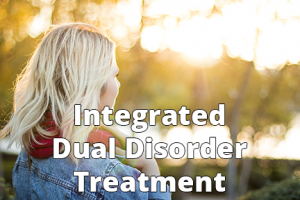 The Integrated Dual Disorder Treatment (IDDT) model is an evidence-based practice that seeks to improve quality of life and promote recovery for people with co-occurring severe mental illness and substance use disorders by combining substance abuse services with mental health services. Recently, the authors of the IDDT model have been working on integrating IDDT into the Illness Management and Recovery (IMR) model, to create a curriculum which is being referred to as Enhanced Illness Management & Recovery (E-IMR). The E-IMR curriculum more specifically addresses substance use and mental illness. To view the newest version of the EIMR manual, please click here. In 2014, OCEACT hosted a three day E-IMR training with Lindy Fox. There were twelve Oregon ACT providers which attended the training, ten of which participated in implementation consultation with Lindy Fox following the training.